This recipe is one of my favorite ways to cook potatoes, and you can use just about any potato, but I really love it with little fingerling potatoes. You can get fingerlings in white, red, and purple. I got a mix of all three at Costco. I originally created this recipe for making potatoes on my Traeger pellet stove (barbeque), but my Traeger still isn’t working because we don’t have a truck to take it to the repair shop. So I’ve had to improvise and make it in my oven. I decided to include a bonus recipe, too, that I made at the same time as the potatoes: Oven Roasted Peppers and Onions. They were a nice complement to the potatoes and the Pan-Fried Cube Steaks we had for dinner last night. One thing I love about both the potatoes and the veggie recipe is the easy clean-up! You just crumple up the aluminum foil and throw it away, and rinse the cookie sheet. Select enough fingerling potatoes for the number of people you need to feed. Remove any large eyes or spots from the potatoes and slice into small pieces. 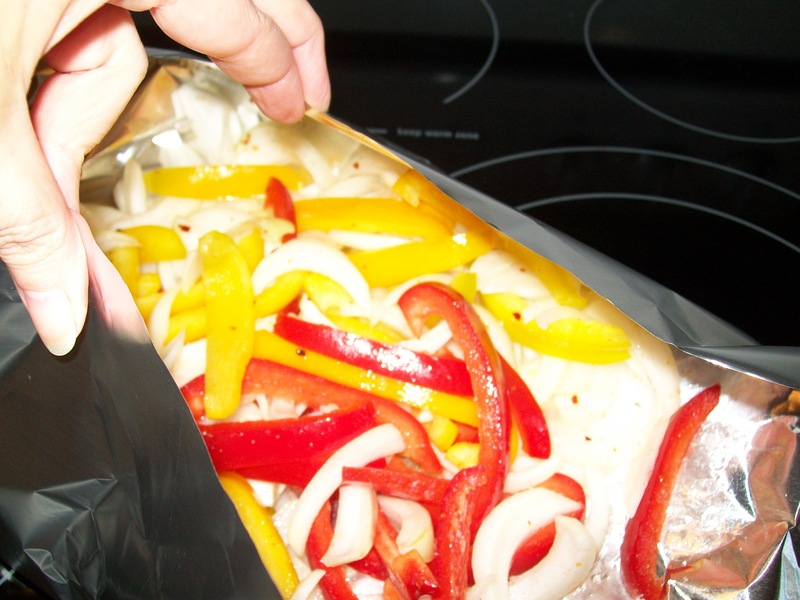 Lay out a large piece of heavy-duty aluminum foil. (If you only have regular foil, double it for strength). Spray the center of the foil with Pam or other non-stick spray. Place the potato pieces in the center. Salt liberally and sprinkle with rosemary, parsley, or other herbs. Add olive oil and mix the potatoes around by hand to coat with oil. Close up the foil into a packet with the ends folded up to keep any juices in. Place the packet on a cookie sheet to make it easier to take it out of the oven. Roast at 375° for 45 to 50 minutes. Remove from oven and open the foil packet carefully. Once the potatoes are in the oven, remove the seeds from the peppers and cut into slices. Cut onion into slices. 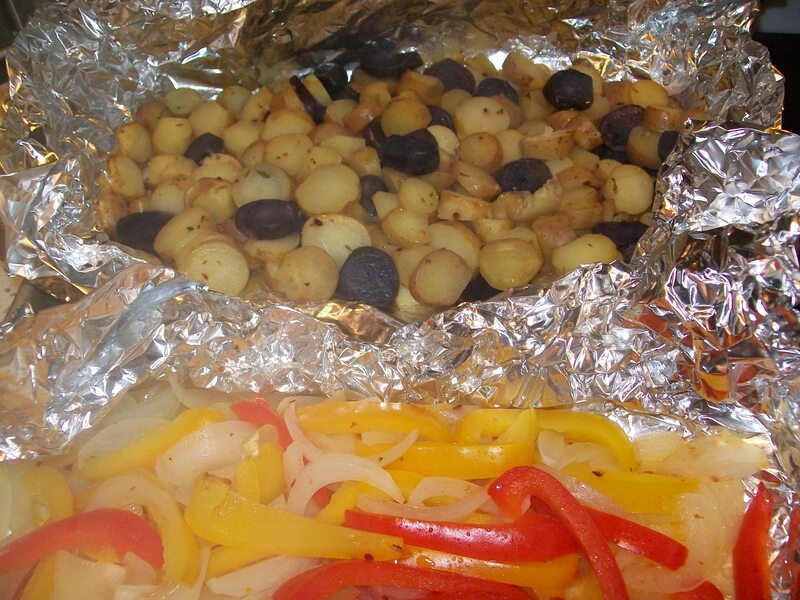 Prepare peppers and onions in the same manner as the potatoes and seal them up in a foil packet. Put the packet on the cookie sheet next to the potatoes. Roast for 35 to 40 minutes. Remove from oven with the potatoes. This entry was posted in Christian Living and tagged Cooking, Eating, Family, Food, Gratitude, Life, Onions, Peppers, postaday2011, Potatoes, Recipe, Recipes, Red Peppers, Roasted Vegetables. Bookmark the permalink. 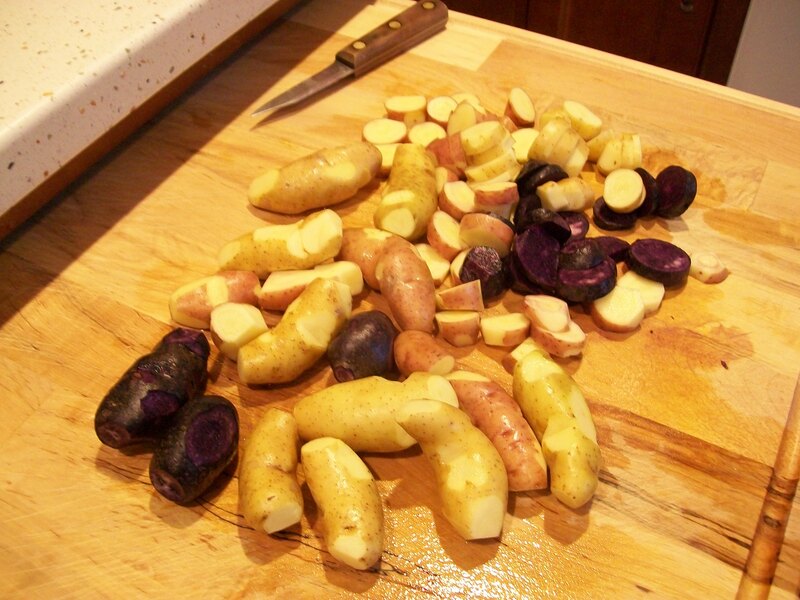 Thanks for the recipe and step by step preparation for these fingerling potatoes. Great post. Do they taste any different, Linda? I love that this is simple and basic and good!!! thank you and God bless you and your cooking!